A 3 mile walk from Greenwich Station (DLR & National Rail) to Cutty Sark DLR Station. There are plenty of places for refreshments and things to do in Greenwich to make a day of it. Note the former Cigar Warehouse alongside the pub. Queen Elizabeth College was founded in 1574 and rebuilt by the Drapers Company in 1817. The houses in Brand Street to the right were built in the 1830s by George Smith for Morden College. The small house at number 26 contrasts with the large double fronted one at number 15. There is an inscription 'Royal Circus Tea Warehouse' on number 12. Further along is a former meeting room. The railway line to Greenwich Park ran just beyond this. Cross Royal Hill, noticing small shops to the left. Walk through Gloucester Circus ahead, keeping right of the central garden. This was designed by Michael Searles in 1791-1809. The opposite side was built as a terrace 30 years later but much of it had to be rebuilt after WWII bomb damage. Exit into Crooms Hill and go right. Crooms Hill Grove to the right has houses of 1838. Right along King George Street. There are a mixture of buildings in this road. Notice the cars in the basements of the new houses! Number 69 is a former pub and beyond this is the entrance to Greenwich Park School (view of this further along). Look at houses in Georgette Place and Luton Place (both cul-de-sacs) to the left. Between these The Hall was built in 1816 as a Methodist Chapel and the adjoining small hall dates from 1879. Old stables of 61 Royal Hill have been converted into cottages accessed from this street. Go left along Royal Hill. This road has a mixture of houses, shops and pubs. The Hill was the Barley Mow pub with attractive tilework. Opposite is a former hay and coal merchants premises (inscription). There are attractive houses of the 1840s. Over number 14 is an inscription 'Hamilton Terrace'. Opposite number 67 go right into Diamond Terrace. Follow this round to the right then continue ahead. There are views of the Borough Hall, Canary Wharf and St Alfege's Church to the right. Left at Point Hill then second right along Maidenstone Hill. There is a plaque 'College Place East' above number 17. Number 35 (built 1799) was the estate office for Morden College to whom neighbouring properties of the 1840s belong. The oddly shaped number 37 is part of 'College Place West'. Between these go along the path and continue up the shallow steps. Go up the steeper steps to the left onto the Point. This gives views over New Cross, Deptford and Greenwich to London and Docklands. A board shows some highlights. Underneath are the Blackheath Caverns, former chalk mines, finally closed in 1946 after serving as a tourist attraction in the first half of the 19th century. Walk away from the viewpoint bearing right across the open ground. Left down Point Hill then right at Westgrove Lane. Left along West Grove. There was a conduit head of 1710 on the corner (plaque). Across the heath is the Ranger's House. The central portion is from 1700 with later wings added. It is managed by English Heritage and houses the Werner Collection (limited opening). Further along on the right is MacCartney House, a home of General Wolfe, altered by Sir John Soane in 1802 and now converted into flats. There are notable houses such as the White House (c1690), Manor House of 1695 (built for Admiral Sir Robert Robinson), Park Hall (1723) by John James and Hillside (1723 altered 1799). The RC church of Our Lady Star of the Sea, designed by William Wardell in 1851, has a tall spire and furnishings by Pugin. Heathgate House, formerly the presbytery, dates back to 1635. Mays Buildings of 1774 were built on part of The Grange gardens. The Grange is an attractive house of 1801 with a gazebo by Robert Hooke (1672). There is an 18th century Standard House to the right attributed to Hawksmoor. Walk down the path running parallel to the road and exit at the next gate. Continue down Crooms Hill. The Fan Museum occupies an attractive house at number 12. Opposite is the modern front of Greenwich Theatre which was converted from an old music hall in 1969. Detour into Nevada Street to view the retained 1885 facade. The corner restaurant was a former coaching inn the 'Spread Eagle' whose yard entrance remains. Cross Stockwell Street into Burney Street. The Borough Hall was designed by Clifford Culpin in 1939. 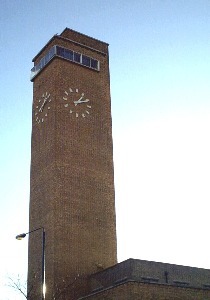 Since 1964 Greenwich has been managed from premises in Woolwich. On the corner is a plaque to: Doug Mullins 1932-91 Master Dairyman born over shop on this site. Around the paved area before the cinema is masonry from the Workshop for the Blind. 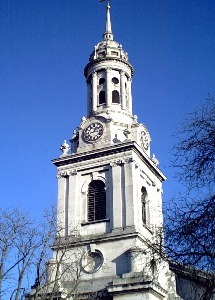 The present St Alfege's Church was designed by Nicholas Hawksmoor in 1714 with a tower of 1730 by John James [pix]. The church hall (built 1814 but extended) was the Greenwich National School of Education and Industry for Girls. Alongside this go into the former churchyard and follow paths to the right. Some of the graves have been cleared to provide sports facilities. A old mortuary building is visable in the corner. In the cul-de-sac at the end are the former Coroner's Court (1902) and Weights & Measures Office (1900). Continue into Creek Road for access to the station.